Moray farmer Stan Copland always knew he wanted to follow in his father’s footsteps. He began looking after livestock before his 15th birthday at Viewfield Farm near Urquhart. His chosen career had an inauspicious start, as he was kicked in the head by a cow on his first day in the job. The incident failed to dissuade him, however, and it is only now, nearly six decades on, that has hung up his boots. Mr Copland, now 73, was yesterday presented with a long-service award by Ian Robertson, owner of Linkwood Farm, to mark his retirement. Mr Copland served his final employer for 45 years as a stockman, working with the farm’s cattle. 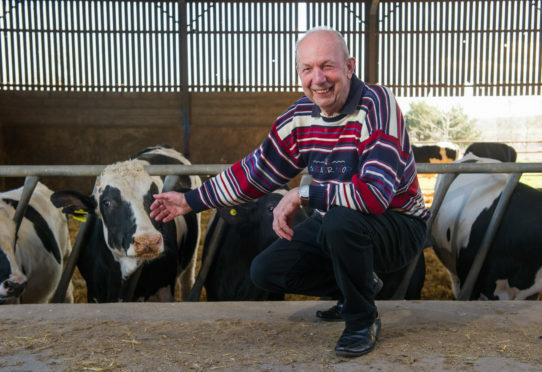 Reflecting on his career, he said: “My father had been at Viewfield Farm for 40 years and on my first day I got kicked on the nose by a dairy cow that was a bit jumpy. “It gave me a bit of a fright at the time and I’ve had plenty more since then, but it was never going to stop me following my father. “That’s just what you did back then. “It’s been great. I’ve enjoyed seeing the calves getting reared. It’s very rewarding. Mr Copland served the majority of his career on Linkwood Farm in the south of Elgin, tending to dairy cows and their calves. After milking operations ceased there, he spent the final days of his working life at Barmuckity Farm, which is also owned by Mr Robertson, with a herd of about 250 beef cattle. 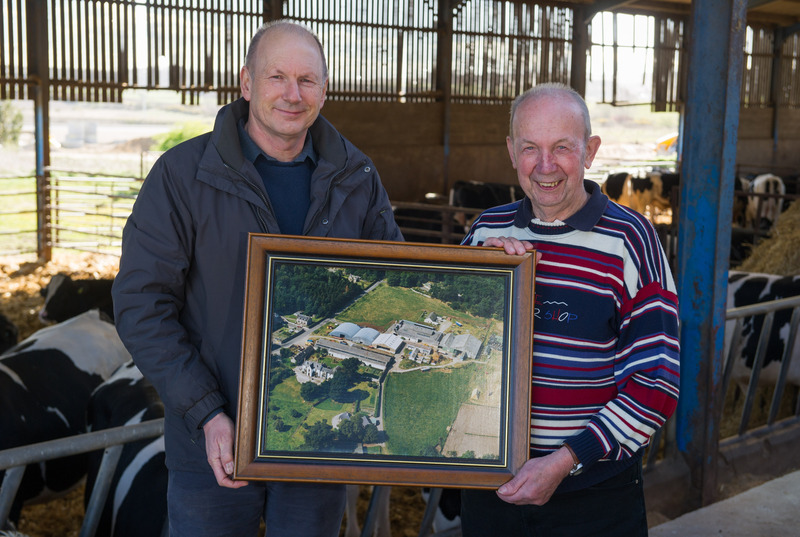 Yesterday, Mr Copland was also presented with an aerial photograph of Linkwood Farm as it looked during his time working there. The farmer now intends to spend his retirement enjoying cruises and time with his wife Fay and the rest of his family from his new home. 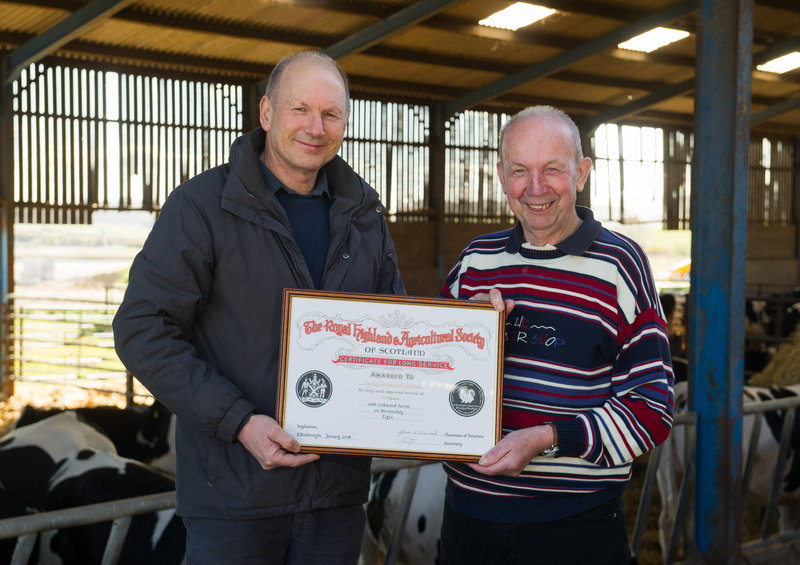 Stan Copland is presented with a long-service award after 45 years service to agriculture in the area at Barmuckity farm, Elgin. It has been built as part of a housing development on the site of Linkwood Farm, where he lived for decades in a cottage. Mr Robertson said: “It was my father who employed Stan when I was just young. “He is someone who has always been there from my perspective.